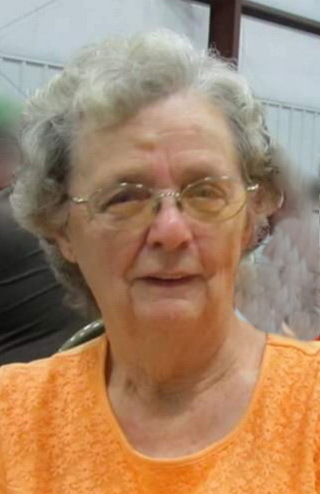 Alba Faye Pruitt, age 83, ascended to her heavenly home on December 14, 2018. Her visitation will be Monday, December 17, from 5:00 – 8:00 p.m. at Spry-Williams Funeral Home. The funeral service will be Tuesday, December 18, at Mt. Tabor Church in Zip City at 11:00 a.m. with Brother Greg Reynolds and Brother Craig Mason officiating. She will lie in state an hour before the funeral. Burial will be in the adjoining cemetery. Mrs. Pruitt was a Christian and a member of Mt. Tabor Church. She was a loving wife and mother and dedicated her life to serving Christ and taking care of her family. She had many friends and was kind to everyone she met. Preceding her in death were her son, Myron Pruitt; parents, Allen and Gladys Roberson; sister, Lavaughn Gallien; and brothers, Elvis, T.A., Terry and Bobby Lee Roberson. She is survived by her loving husband of 65 years, E. R. Pruitt; daughter, Emily Mason (Craig); sons, Ray Pruitt (Bonnie), Lance Pruitt (Elieth), Barry Pruitt and Chris Pruitt (Kay); grandchildren, Justin Mason (Chloe), Dustin Mason (Courtney), Bradly Mason (Maleah), Matthew Pruitt, Elizabeth Pruitt, Melanie Pruitt, Alexandria Pruitt, and Denio Pruitt; great-grandchildren, Zeke Mason and Everlee Mason; brother, Sterling Roberson; sister, Rella Martin, and special pet “Prissy”. Nephews will serve as pallbearers and her grandchildren will be honorary pallbearers. Ray, I’m so very sorry to learn of the loss of your mother. You, your Dad, and Bonnie will be in my heart especially this Christmas. I hope it brings comfort to you knowing she loved you, and that you have friends who share your grief. I love each of you so much ! Aunt Fay was always a special person in my life and encouraged me many, many times through the years. I have tons of beautiful memories of time spent with her through the years. We sang many songs together, hugged many times, worked on Thanksgiving dressing with some of her secrets, delivered florist flowers when her and Momma ran the Zip City Florist, and so very much more. Her and my Mom spent many hours praying for our families and Mt. Tabor. It was a labor of love ! May God bless each of her family members, she was loved by us all !! May God comfort us all with the sweet memories and we know we will meet again in Heaven on day. I am sure she is loving Jesus presence and our sweet Myron now. Lance and family, we are so sorry to hear about your mother.. May God comfort and strengthen you all. Birdie Riley Harrison and family..